Five months prior to the start of the 35th edition of photokina on 26 September 2018, the organisers are expecting every single exhibitor space in the halls in Cologne to be filled. Leading companies of the industry like Arri, Canon, Cewe, DJI, Epson, Fujifilm, Kodak Alaris, Leica, Manfrotto, Nikon, Olympus, Panasonic, Profoto, Sigma, Sony, Tamron and Zeiss have already secured their stands at the coming event. The application phase is also moving full speed ahead for photokina 2019. 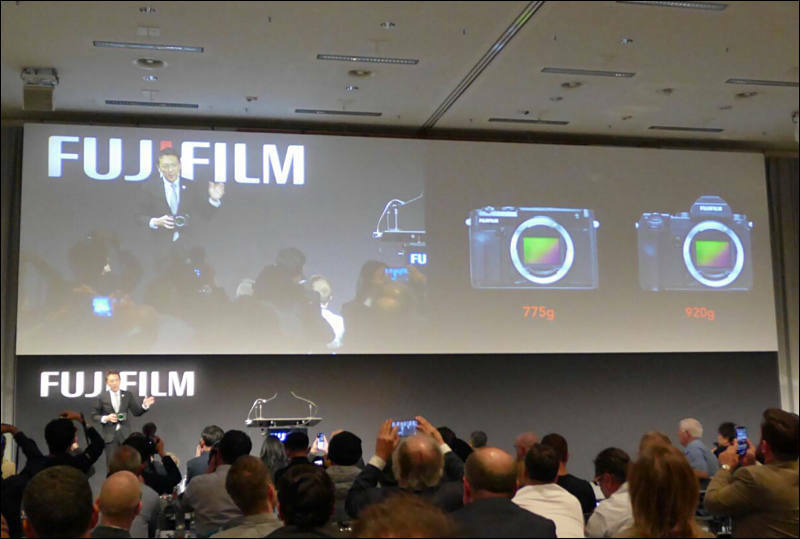 "Last year we reached a series of important decisions affecting the future of photokina, and can now see that these decisions are already having a positive impact in 2018", according to Christoph Werner, Vice President Koelnmesse. "We are pleased that many technology leaders have decided in favour of participation in photokina – in some cases extending beyond 2018." Photokina is also of great interest to young companies. With the Imaging Lab, a format was created that brings together start-ups, research institutions and the innovation departments of the technology leaders to jointly enable a look into the future of imaging. 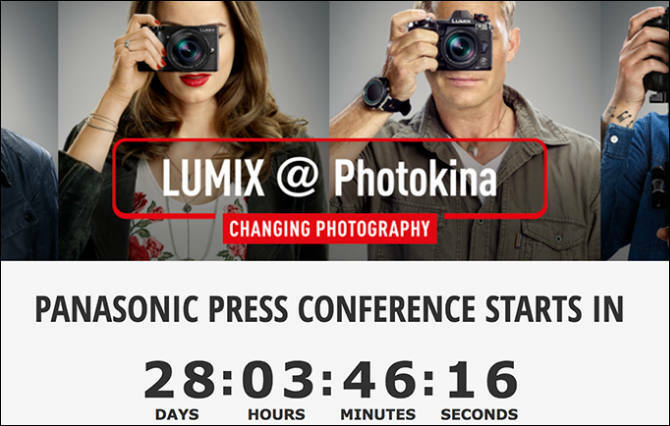 Pentax/Ricoh also will announce good stuff right before or on Photokina. London, United Kingdom, 6 September 2018 – Nikon prepares to take centre stage once again at the world’s leading imaging show, Photokina, in Cologne. Visitors will be given hands-on access to the latest products, including a look at its newly announced full-frame, Nikon FX-format Z mount mirrorless cameras, lenses and lens mount adapter. Visitors to Nikon’s booth in Halle 2.2 can also test Nikon’s wide range of professional DSLR products, including the award winning FX-format Nikon D850 which, with an ISO range of 64–25600 and 45.7MP sharpness, provides the ultimate combination of resolution, speed, and light sensitivity. 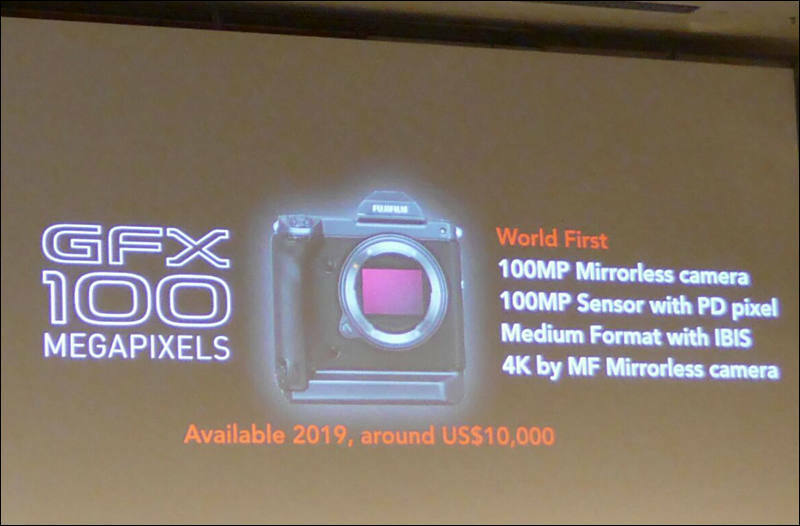 There will also be a wide range of Nikon cameras and NIKKOR lenses to get to grips with, such as the recently announced entry-level D3500, megazoom COOLPIX P1000, as well as the high-performance, super-telephoto AF-S NIKKOR 500mm f/5.6E PF ED VR lens and the AF-S NIKKOR 180-400mm f/4E TC1.4 FL ED – the first telephoto lens in the NIKKOR line-up to boast a built-in 1.4x teleconverter. Some of the best photographers in the business will also present at Nikon’s booth, discussing their experiences of shooting on Nikon equipment. Nikon Europe Ambassador and renowned fine art photographer David Yarrow will talk about his evocative and immersive photography of life on earth, and the challenging journey he has undertaken to achieve such a unique style. Meanwhile fellow European ambassador, Italian-born wedding photographer Nadia Meli will reveal her experience testing out the new Z mount system, and its compatibility with both the new and existing NIKKOR lenses. British photographer and urban film maker Rob Whitworth, rising star Jamari Lior, award-winning photographer and film maker Pep Bonet, Nikon Nordic Ambassador Frøydis Geithus and sports and news photojournalist Lukas Schulze, complete this year’s stellar speaker line-up. London, 21.08.2018 – The Olympus Perspective Playground is an art exhibition with interactive and walk-in installations created by internationally renowned artists. After sixteen Playgrounds with more than 400,000 visitors across Europe, the exhibition is going to stop at photokina this summer. From 26-29 September 2018 fans of photography and art will be able to explore our creative photography festival on more than 2,000 square meters in hall 1 of the Koelnmesse fairgrounds, including evening hours after the official fair opening. Whether enthusiast or professional photographer, the Playground allows anybody to test drive the compact OM-D or Olympus PEN cameras and experience art through the lens. The memory card with all pictures can be taken home as a gift. Entrance to the Olympus Perspective Playground is free of charge for all photokina visitors. All Olympus newsletter subscribers that register their Playground visit will receive free admission to the photokina. United Kingdom, Republic of Ireland, 18 September 2018 -- Following its recent global launch, the pioneering and revolutionary EOS R System, camera and RF lenses will be on public display at photokina, in Cologne, Germany, exclusively on the Canon stand (Hall 3, level 2) for visitors to touch, try and experience. From Wednesday 26th to Saturday 29th September 2018, Canon will be showcasing its strongest line-up yet at the show, catering for every step of the photographic journey with a host of imaging, print and video products, designed for professionals and enthusiasts alike. Canon's range of camera equipment has been created with over 80 years of technical expertise, blending innovation and design with pioneering technology and craftmanship, to create award-winning imaging and video products that continue to pursue perfection in every area. Over thirty years on from the original, era-defining EOS launch, the pioneering EOS R System delivers an entirely new level of innovation, enabling richer, more detailed results, with unparalleled levels of sharpness and detail. Taking photography and filmmaking into an exciting new era, the EOS R's innovative new RF lens mount has been engineered with the perfect blend of optical, mechanical and electronic design, to capture unique moments in previously impossible ways. Visitors to the Canon stand can experience the EOS R's remarkable features first-hand, including the world's fastest autofocus[ii] low-light shooting capabilities and impressive levels of customization. "Canon exists to inspire and enable photographers and filmmakers, at every level, helping them to explore a world of exciting imaging possibilities -- both now and in the future" said Alessandro Stanzani, EVP of Canon Imaging Technology & Communications Group -- Europe, Middle East & Africa. "We are particularly proud and excited to showcase the revolutionary EOS R System with its innovative RF lens mount, which launched to incredible acclaim earlier this month. At photokina, visitors to our stand will be able to get hands-on with the new EOS R and experience the optical superiority of our RF lenses for the first time." Throughout Canon's entire range, from the recently launched PowerShot SX740 HS and the award-winning EOS M50 to the standard-bearing EOS-1D X Mark II -- Canon has a camera to meet all photography and videography needs, from professionals just starting out, to enthusiasts capturing special memories, or independent filmmakers shooting their latest film. Canon's product experts will be on hand at the Expert Bar to help attendees pursue the perfect shot and expand photographic knowledge. Pushing creative boundaries and championing visual storytelling, Canon's globally renowned ambassadors will be on Canons' Spotlight Stage, hosting a series of insightful and compelling talks and workshops throughout the four-day show. From adventures in the South Pacific with Ulla Lohmann, to Katya Mukhina's experience shooting landscapes with the EOS R in Iceland, they will take visitors around the world with their unique stories. Join the Canon stand to hear 'How to' talks - whether it is finding out how to take the leap from stills to video or learn the best way to print vivid and attractive landscape images, the ambassadors have it covered. From capturing stunning images to printing and sharing them with friends and family, Canon supports users at every stage of their imaging journey. The full PIXMA and Pro Print range will also be in action to demonstrate how Canon's world-class print technology and inks transform digital image libraries into high-quality prints. The imagePROGRAF series will show the impact and magic of printed images, in large scale, which can be viewed in the Print Gallery. Canon Professional Services (CPS) will also be at photokina, ensuring professionals are equipment-ready to do their job, whatever the circumstances. The service includes a priority repair service, back-up kit loans (dependent on membership) and support -- both on-the-ground and via a dedicated helpline. Keep an eye on the @CanonEvents Twitter feed and Pro photography Facebook page for regular updates and exclusive live content from the Canon stand including Q&As with Canon's ambassadors and product experts. 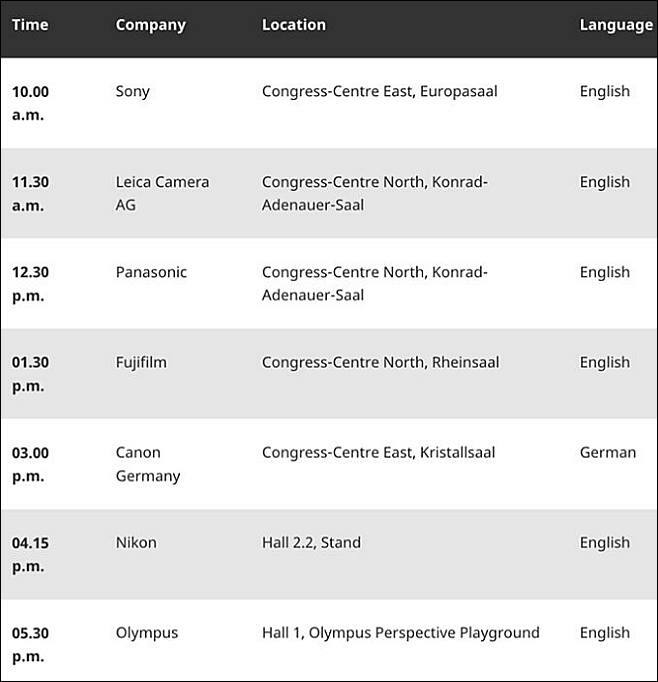 The Canon stand at photokina can be found in Hall 3, level 2. Schneider-Kreuznach will present several B+W innovations at Photokina 2018 in Cologne, Germany next. Top brand products are being copied more and more frequently and brazenly -- to the detriment of manufacturers, retailers and customers. For this reason, the new B+W filter cardboard box is now equipped with a new security hologram. In addition to the well-known Schneider hologram with several hidden security features, further measures provide protection. These include a strongly encrypted numerical code that can be counter-checked by direct inquiry: The alphanumerical structure consists of a combination of numbers and letters that cannot be guessed, which is not repeated and is particularly safe from manipulation. The new packaging concept will be supplied as from Photokina 2018. Further information can be found at www.schneiderkreuznach.de. The length of exposure time can be determined easily using the new app "B+W ND-Calc". By turning the outer ring on the display, the exposure time measured without a filter is transferred, then the density of the grey filter used (ND value) is set, and the result of the corrected exposure time is immediately available. The B+W app includes a timer with which the exposure time can be monitored after 4 seconds by pressing the inner ring (Bulb camera setting). The B+W ND Calculator app is available for Android and iOS. It is ad-free and can be downloaded from the Google Play Store and the App Store. Further information can be found at www.schneiderkreuznach.com. B+W is replacing the black chrome plating of its filter mounts with an innovative paint finish, thus improving the gliding properties and simplifying the screwing in and out of the filter. The new coating also prevents surface abrasion (sooting), which was unavoidable with the previous production method. In addition, the filter mount is given a more modern and homogeneous look, and the matt finish prevents unwanted reflections. The production changeover is planned for all filter holders; implementation has already begun. Photographic filters from B+W harmonize perfectly with the high image quality of modern lens systems. To retain this performance, the glass surfaces must always be clean. Dirty or scratched surfaces reduce contrast and sharpness and can cause an unwanted soft focus effect. B+W offers a wide range of cleaning accessories to keep filters and other sensitive optical glass surfaces such as glasses, binoculars, VR glasses or mobile phone displays clean. For example, the tried and tested Photo Clear cleaning cloth, which is silky soft, particularly supple and has excellent cleaning properties. Even without liquid cleaning agents, the extremely dense microfiber fabric gently removes dirt and fingerprints. It has a handy size of 20 x 18 cm, comes in a small case and fits in every photo bag. The cloth is now available in the colors pink, blue, navy and black. In addition to individual cloths, Photo Clear boxes with twelve cloths of one color are also available. Another smart solution: the Photo Clear Colorbox with three cloths per color version. Photo Clear in the colored versions is available immediately from photo retailers, RRP per cloth € 8,00. Further information can be found at www.schneiderkreuznach.com. B+W's new packaging concept also includes the development of a new Lens Cleaner counter display. The display with the B+W Lens Cleaner and Photo Clear Cloth can be set up at the POS in just a few steps and contains nine pieces each of B+W Lens Cleaner liquid and Photo Clear microfiber cloths. Both cleaning products are popular helpers with which not only filters and lenses can be optimally cleaned. Glasses, binoculars, VR glasses, LC displays and other coated optical surfaces can also be cleaned easily and without much previous knowledge. More information about cleaning can be found at www.schneiderkreuznach.com. The fully equipped Lens Cleaner counter display is now available under ID 1092792. Further information can be found at www.schneiderkreuznach.de. With polarized light and a polarizing filter on the camera, exceptionally vivid color effects can be achieved. This trend is also followed by the new B+W polarizing film, which can be positioned in front of a light source with an adhesive strip, rubber band or a clamp -- for example in front of flash units, LED photo lamps, flash systems or (but only to a limited extent due to heat generation) repro lamps. The polarizing film can be cut to size or punched without any problems and is also flexible, color-neutral and homogeneous. Objects with tensions are positioned between the polarizing light source and the lens fitting with a polarizing filter. This makes tensions optically visible and reproduces them with colorful effects. This works easily with clear plastic parts, e.g. a ruler. The process is also suitable for repro photography when reflex-free images are required. The polarizing film is available from photo retailers in material thicknesses of 0.3 or 0.8 mm from a size of 50 x 50 mm at an RRP starting at € 7,00. With its high efficiency, the new B+W professional microfiber cloth is particularly suitable for coated optical surfaces such as photo filters and objective lenses, but also for glasses, VR glasses and displays. It is light and easy to use and, thanks to its size of 30 x 30 cm, is particularly suitable for large-area use on square filters, mirrors and tablet screens. The microfiber cloth is washable up to 30° C, comes in a sturdy case and is available immediately from specialist photo retailers, RRP 11,00 €. Images with extreme contrasts are very popular. B+W offers an infrared filter that absorbs almost the entire visible light spectrum. This uses the residual sensitization of the camera and reproduces motifs in almost pure black and white. A popular motif is grass or foliage which is shown as snow-white, combined with a typical dark sky reproduction. The range of this filter series has been extended to include the diameters 82, 86 and 95 mm. B+W IR Filters 093 are available from Ø 37-Ø 95; RRP from € 50 to € 300, depending on the diameter. B+W is expanding its range of square filters for 100 x 100 x 2 mm filter holder systems to include a model with an exceptionally high density for particularly impressive time exposures. An excellently ground and finely polished special glass serves as the basis. It guarantees indispensably high optical quality, thanks to which full contrast and sharpness performance is maintained even with high-resolution professional camera systems. The filter discs fit not only in the filter holder from B+W, but in all holders on the market that are designed for filters with a width of 100 mm and a glass thickness of 2 mm. A special coating process allows high ND density. Thanks to optimized color reproduction across the entire visible light spectrum, subsequent image processing is easier and more time-saving for the photographer. The filter discs are characterized by their high scratch resistance as well as dirt and water repellency and are particularly effective and quick to clean. 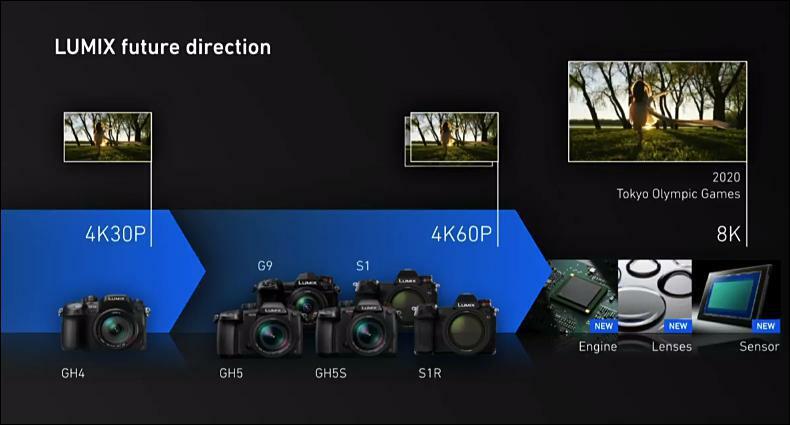 The optical density ND 4.5 corresponds to +15 f-stops. In practice, this means that the exposure time of 1/60 s without filter increases to eight minutes with filter. The filter disk is available under the article number 1093504 at an RRP of € 189,00 via specialized photo retailers. Further information can be found at www.schneiderkreuznach.com. We shouldn’t expect any new product announcement (camera or lens). Sony unofficially told journalists to wait til October to see some new stuff. On Tuesday, September 25th at 10 AM Pacific (U.S.) we'll reveal our big announcement live! Dan Harlacher and Dylan Kotecki will show what's coming to ON1 Photo RAW. There will be plenty of chances to see what we've been up to and ask questions. Don't miss it! Photokina 2018 is the world's largest photo and image exhibition, which is held in a 150,000 m2 venue and where about 1,000 companies from about 42 countries participate. It is expected that over 190,000 visitors from about 133 countries will attend. 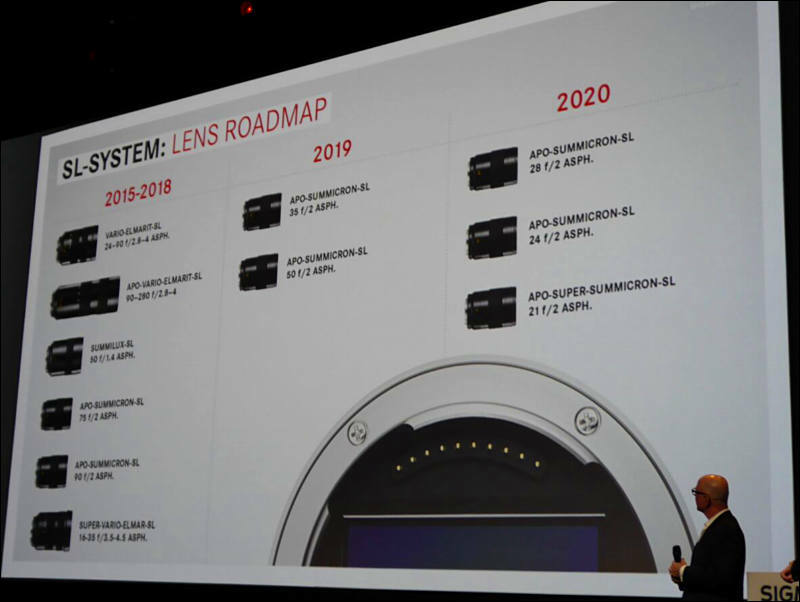 Since its establishment in 1972, Samyang Optics has made its Manual Focus lenses with an outstanding resolution as its main product, and by launching six new products on average annually, it is recognized as a company of innovation and challenge in the global optics world. While diversifying product lineups with AF lens lineups aiming at the mass market, it is ceaselessly exerting efforts in developing the premium lens lineup XP series, which integrates its MF lens optical technologies that have been accumulated for 40 years. Through these XP products, the company provides brand experience that enables users to demonstrate their unique sensitivity and creativity through manual lenses. Following its VDSLR lenses exclusive for video, based on MF technology, with its cine lens XEEN, Samyang Optics is growing into a total imaging solution company. XEEN creates an excellent picture with X-coating Technology, which has been newly designed to create a cinematic look, and for this it is recognized as a lens that can realize beautiful colors and images that maximize the users' creativity. This is also known as the lens that is patronized by the globally renowned movie directors Shane Hulburt and Steve Gainer, and Joseph Kahn, the director of Taylor Swift's music video. For detailed information about Samyang lenses, please visit the Samyang Optics home page or Samyang Optics' official Youtube channel. Samyang are also on Facebook. My 80's vintage Sumicron-R 90mm f/2 is still to this day my favorite portrait lens. 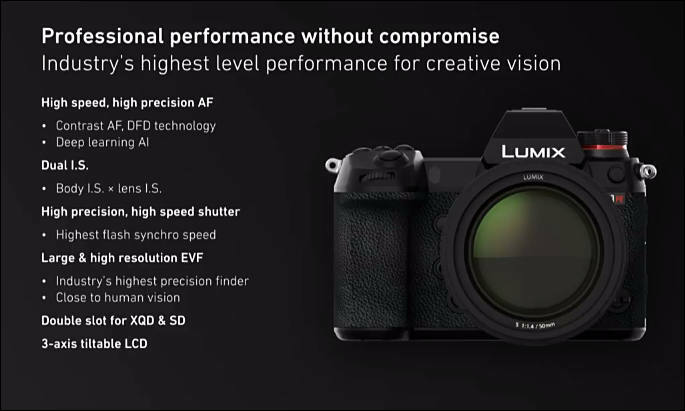 If the apo-summicron-sl version of it uses a similar (obvs tweaked given the "apo" in the name) optical formula and if any cameras in the system have eye focus AF, that lens will be really special.